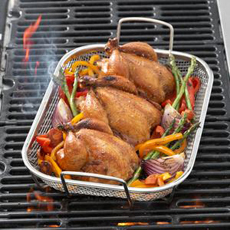 Make your grill safety technique match your mouth-watering food. Large mesh basket available at SurLaTable.com. MARTHA M. HOWARD, MD is a member of ChicagoHealers.com. CAPSULE REPORT: Barbecuing is one of America’s favorite pastimes. However, it’s hard to believe that this enjoyable and easy meal option can cause food poisoning and even cancer! If you practice “safe grilling,” you can have your cake (or beef, chicken and fish) and eat it, too. These tips are from a physician! An April 2006 presentation at the American Association for Cancer Research showed that when PhIP, a barbecue/char chemical, was added to rats’ food, they developed cancerous changes in their intestines, spleens and prostates within four weeks. HCAs, heterocyclic amines, are also produced when meat is charred. This compound can increase the risk of breast, stomach, colon, and prostate cancer. PAHs, polycyclic aromatic hydrocarbons, are produced by smoking fat from chicken, fish or meat and can damage lung, liver, skin and kidney tissue. So as much as you like the flavor and/or the look of charring, discretion is the better part of valor. Charred food is not safe food. Follow this checklist to maximize your grill safety. Clean The grill. Get rid of the old fats left over from previous meals. Avoid Petroleum Starters For Charcoal. If you use charcoal, use a wood starter and stack your charcoal up in a two-pound metal can with the ends cut off. Lift off the can with tongs and spread out the coals when they are well started. Work Quickly. Avoid a time gap between opening the valve and starting the grill. Wash Your Hands. Keep your hands clean and use separate plates and cutting boards for raw and cooked meats. Be sure to wash your hands again before putting on long, heat-proof barbecue gloves. Trim Meat. Trim most of the fat from meat; less fat means fewer PAHs. Use Marinades. Marinades protect the meat from charring. Put the marinade on, and refrigerate until use. Defrost In The Fridge & Don’t Let Meat Sit Out. This enables bacteria to multiply. Avoid taking burgers, chicken or other meats directly from the freezer to the grill. Let them defrost on the lowest shelf of the fridge or in the meat drawer, to avoid contamination of foods by dripping raw juices. Pre-Cooking. Pre-cook items prior to grilling, especially raw brats and sausages. Grill Smaller Pieces. Cut meat and chicken into smaller pieces so they cook through. Flipping. Turn down the fire, and flip your burgers, chops, chicken or steak often, so they cook through. Aim for golden brown, not charred. Meat Thermometer. If you are cooking a thicker portion of meat or chicken, use a meat thermometer. 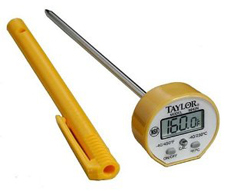 Taylor makes a waterproof meat thermometer, available at Amazon.com. Cleaning Up. At the end of the barbecue, be sure to put out the charcoal completely. If you are using propane, be sure the valve is turned off.